(From Nikon lens literature) Nikon Corporation is pleased to announce the release of the AF-P DX NIKKOR 18-55mm f/3.5-5.6G VR and AF-P DX NIKKOR 18-55mm f/3.5-5.6G, two normal zoom lenses compatible with Nikon DX-format digital SLR cameras. The AF-P DX NIKKOR 18-55mm f/3.5-5.6G VR and AF-P DX NIKKOR 18-55mm f/3.5-5.6G are 3.1x normal zoom lenses covering the 18-55mm range of focal lengths (effective angles of view equivalent to those of a lens with 27-82.5mm focal lengths in FX and 35mm  formats). They are the first "AF-P" lenses for Nikon digital SLR cameras, utilizing stepping motors to drive AF for fast and quiet autofocusing. In addition, they have a compact and lightweight design for which retractable barrels were adopted for excellent portability, and the use of two aspherical lens elements has resulted in superior optical performance with which various types of aberration, including distortion and spherical aberration, are effectively suppressed. The AF-P DX NIKKOR 18-55mm f/3.5-5.6G VR is also equipped with a vibration reduction (VR) mechanism offering camera shake compensation equivalent to a 4.0-stop* (with testing in accordance with CIPA standards) increase in shutter speed. The combination of superior AF performance and excellent agility afforded by these lenses makes them perfect for those ready to try their hand at full-scale photography with a digital SLR camera. *At the maximum telephoto position when a digital SLR camera equipped with an APS-C size image sensor is used. 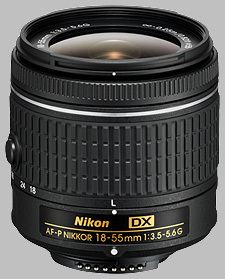 The Nikon 18-55mm f/3.5-5.6G DX AF-P Nikkor doesn't have any user reviews yet!